The class III gold foil is perhaps the most difficult procedure in operative dentistry to master. It has been used as a gauge of proficiency by many State Boards. 1. To meet the demands of esthetics, it must be inconspicuous; the outline must, therefore, be in harmony with the tooth. 2. There must be adequate access for necessary instrumentation to insert the gold foil. 3. There must be thorough compaction of all of the gold as it is placed, so convenience form is extremely important. 4. In securing convenience form, the important requirement of inconspicuousness of the restoration coupled with conservation of tooth structure and the logical anticipation of permanence must ever be kept in mind. 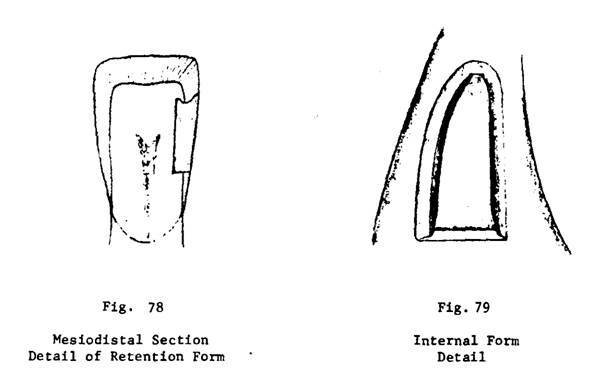 The cavity preparation form here given is the result of refinements of the basic Class III cavity which was originally presented by G. V. Black. A number of outlines for typical Class III preparations have been advocated through the years. This one, refined by W. I. Ferrier, presents the best to date from the standpoint of esthetics, convenience, and conservation of tooth structure. This typical preparation should be learned thoroughly so that the variations from type may be understood when presented later. Class III cavity prepared in upper right central incisor, distal surface, for the reception of gold foil as the restorative material. c. extension for prevention of recurrence of decay. a. Is the key to the preparation. b. Extended gingivally to a level beneath the margin of the free gingiva (Fig. 64). c. Straight line labio-lingually (Fig. 66). d. Approximately at right angles to the long axis of the tooth labio-lingually, dependent on step b (Fig. 66). a. Prepared to follow a line in conformity with the contour of the tooth and in conformity with the approximating tooth (Figs. 64, 67). b. 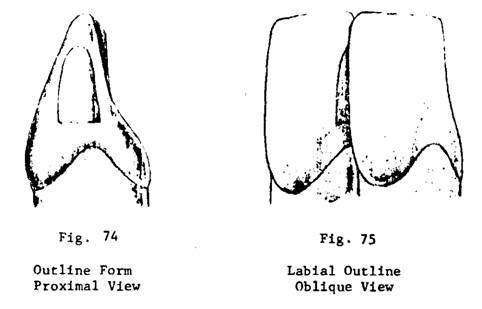 When viewed from the labial the gingival 2/3 - 4/5 of the labial outline has the appearance of a straight line, parallel with the plane of the general contour of the tooth (Fig. 67). 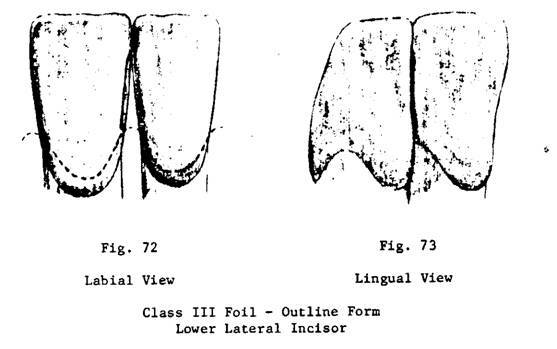 c. When viewed diagonally from over the approximating tooth, the labial outline should, in general, parallel the contour of the line angle of that tooth (Fig. 64). d. Incisal 1/5 presents a curve that blends in with this line symmetrically and harmoniously, and connects smoothly with the incisal outline (Figs. 65, 66). a. Somewhat different to the labial wall in that convenience is a greater consideration. b. It is governed by position of tooth in the arch and by the shape and position of the approximating tooth. c. The gingival 2/3 of the lingual wall normally is almost parallel with the long axis of the tooth. More precisely it bisects the angle formed by the plane of the contour of the proximal surface of the tooth and the long axis (Fig. 68). d. The incisal 1/3 meets the incisal outline in a more definite curve than does the corresponding portion of the labial outline. e. Joins with the gingival wall at a sharp angle, and forms a definite linguo-gingival shoulder (Figs. 66, 68). a. Extended incisally to include and pass the point of contact with the adjacent tooth so margin of restoration is accessible to cleansing measures. b. Joins labial and lingual outlines in a smooth, regular curve. 1. Is required to meet the forces applied during the insertion of the restorative material. Ordinarily there is no demand for resistance against masticatory stresses in this class of cavity. (2) At right angles to long axis of the tooth labio-lingually. (3) Established so axio-gingival line angle is just within the dentin (Fig. 70). (1) Slope slightly outward from the axial wall forming an obtuse angle with it (Figs. 69, 71A). (2) These angles are formed just within the dentin. c. Labial and lingual present a definite enamel wall in a plane different to that of the dentin wall (Figs. 69, 71A). 1. Retention form is established between the gingival and incisal portions of the cavity (Figs. 65, 69, 70). a. Axio-gingival line angle is acute. 3. 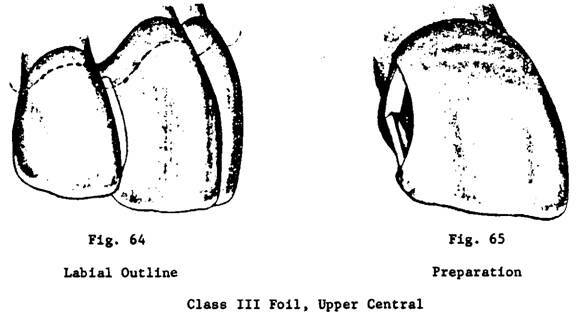 The incisal angle presents a definite undercut, principally at the expense of the incisal wall and to a lesser degree at the expense of the labial wall (Figs. 69, 70). Since this area is cut to provide some bulk of material rather than a sharp point, it is designated the "incisal angle" rather than to call it the "labio-linguo-axial point angle." a. Flat as a rule. b. Just slightly within the dentin. c. Established parallel with the contour of the tooth, inciso-gingivally and labio-lingually, and not necessarily with the long axis or with the central labio-lingual plane of the tooth (Figs. 69, 70, 71). Convenience form requires that the cavity be extended sufficiently to permit the introduction of the instruments necessary for the preparation, and of those necessary for the placement and condensation of the restorative material with the proper line of force. The labio-axio-gingival and linguo-axio-gingival point angles provide "convenience points" for starting the foil (Figs. 65, 69). In some cases, for increased convenience in initial retention, greater bulk of gold is desired in the usual gingival "starting points" than is possible with sharp point angles. This may be accomplished by substituting a small "convenience pit" for either or both of the point angles at the lingual and labial terminations of the axio-gingival line angles. The forming of the pit is the final step of the cavity preparation. The instrument used is a miniaturized, end-cutting, inverted cone bur; the side of the head is slightly hollow-ground so the resultant pit will be somewhat undercut; the diameter of the end of the head may range from 0.40 mm to 0.45 mm. (The diameter of a 33½ inverted cone bur is 1.1 mm). The pit is made no deeper than the length of the head of the bur (0.5 mm); less depth is usually adequate. The cavity here outlined provides the maximum degree of convenience for placing foil, consistent with the requirement of inconspicuousness, and of minimal sacrifice of tooth structure. 1. The enamel walls are finished smoothly with a freshly sharpened cutting instrument and care is taken to be sure that all enamel rods are supported by sound dentin. 2. While a definite cavosurface bevel as such is not established, the planing and correcting of the cavosurface margin to remove loose and fragile enamel rods and to create a continuous regular margin, will automatically establish, in effect, a cavosurface bevel. 3. The linguo-gingival cavosurface margin is finished to a sharp definite angle (Fig. 68). 4. The labio-gingival cavosurface margin is rounded very slightly to relieve any severity in form at this point in the restoration (Fig. 69). Explorers - right angle (G-3), and contra-angle (G-2), fine, sharp, single end. a. Bur is placed first in center of gingival wall from the labial, and drawn labially, forming the labio-gingival angle. b. Then introduce the bur from lingual, and draw it lingually, forming the linguo-gingival angle or shoulder. Note: Amount of extension of gingival wall determines the outline form of the cavity. It is the key to the entire cavity form. 3. Wedelstaedt chisel, reverse bevel, and A-21 hoe to complete outline form. 5. A-21 hoe to true gingival wall and confirm adequate labial extension. 6. 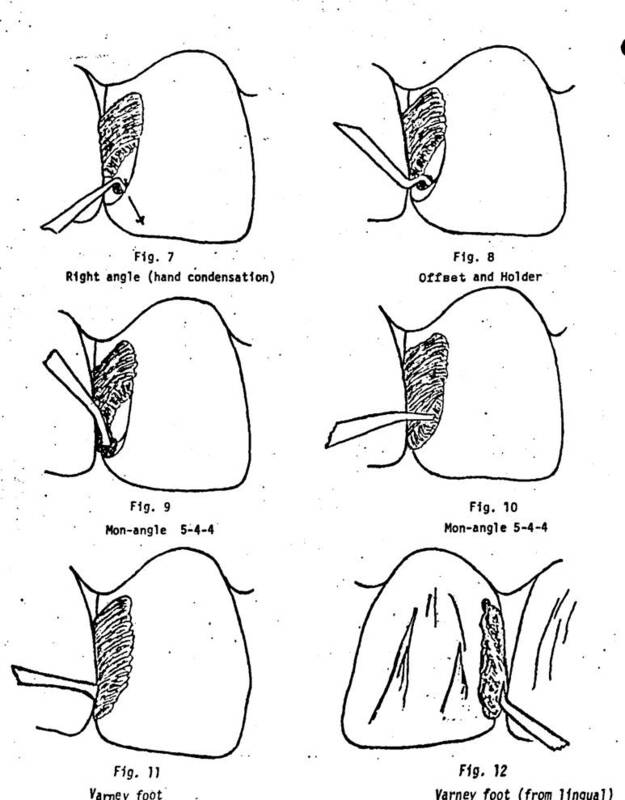 Spear point drill may be used to localize and begin formation of gingival point angles. to rough out incisal retention. a. With shaft at right angles to labial surface, use with combination cutting and lateral scraping motion (giving a square cut retention area). "Cut" incisally, "scrape" axially. b. With shaft parallel with long axis, and the acute end of the cutting edge, very sharp, define the axio-incisal line angle. 9. A-19 hatchet - in cavities of limited labial extension - to sharpen labio-axio-gingival point angle. 10. Wedelstaedt chisel, reverse bevel or A-21 hoe to finish enamel walls to true the cavosurface margins. 11. Wedelstaedt chisel, regular bevel, or A-21 hoe to finish linguo-gingival shoulder and cavosurface angle. 12. Angle formers on the incisal and gingival to finish the enamel walls to true the cavosurface margins. 13. May use A-46 axial plane - to smooth axial wall. 14. 33S bur - (it is often modified to suit the case) may be used to provide increased convenience and retention in gingival point angles. The resultant slightly undercut pit (1/2 - 2/3 the length of the head in depth) is not modified further. This is the final detail in preparation. 15. G-3 explorer (right angle) to clean line angles and point angles to test linguo-gingival point angles. 16. G-2 explorer (contra angle) to test labio-gingival angle and the incisal retention. *Instrument numbers refer to University of Washington set. Foot condenser - Varney 5, or Ferrier "F"
2. Start in linguo-axio-gingival point angle or convenience pit (Fig.1). .4 monangle and holding instrument, from labial. 1/64th pellets (may use a 1/128th first). Compact into angle, from labio-incisal. 3. Cover gingival wall and linguo-gingival shoulder advancing to labio-gingival angle (Fig.2). .5 monangle and holding instrument, from labial. Compact against gingival wall and into axiogingival angle. Hold into linguo-axio-gingival angle. 4. Labio-axio-gingival angle (Fig. 3). Compact into point angle as directly as possible, holding firmly into linguo-gingival angle, from the labial. 5. Wedge into labio-gingival and linguo-gingival .5 monangle. Force directed into cavity and against gingival wall. Be sure linquo-gingival is COMPLETELY covered and well condensed. Keep lingual ahead of labial and axial ahead of the external mass. The line of force should always be toward the axio-gingival. 7. Confirm compaction of central portion, during building up of restoration (Fig. 6). Foot or 3-S oblique-faced monangle, from labial and from lingual. Reach "toe" of condenser into embrasure as fully as possible. 8. Incisal angle (Figs. 7 and 8). Right angle hand condenser, followed by a suitable offset condenser that has been tried in the incisal angle prior to foil compaction. Compact by hand pressure at first. Permit portion of pellet to attach to existing mass of foil to stabilize it. Holding instrument to stabilize gingival mass; offset condenser from labio-gingival, directly into angle. Compact carefully and thoroughly. Separator positioned and stabilized with compound. Compact against incisal wall, chiefly from labio-gingival. Be sure sufficient foil is forced through to cover linguo-incisal cavosurface and to provide required contour in this area. Some compaction can be done from lingual, but addition of gold from lingual in this area is usually unsatisfactory. 10. Complete the contour (Fig. 10). .5 monangle or small parallelogram. 11. "After-compaction" (Figs. 11 and 12). Go over entire surface, to reduce serrations and to detect any incompletely compacted areas. Suitable small, mounted stones, h.p. 1. Increase separation slightly. Pass steel strip through contact. sharp gold knive with light shaving cuts. Cleoid or discoid at lingual margin. Gold knife, as on labial. Inverted cone stone (semi-worn) may be used if concave tooth contour is required, or if there is excessive bulk to remove (Use extreme care that enamel rods are not fractured or crushed). 3/8" discs are useful occasionally. Whenever stripping is done, the restoration must be kept cool with a constant stream of cold air. Occasionally a fine, steel abrasive strip is necessary to clear the contact area. Pass extra-fine, extra-narrow cuttle strip (#1); then fine, extra-narrow strip (#2); then medium grit, narrow width strip (#3). Occasionally medium grit, wide, cuttle strip (#4) is of value to reduce irregularities in contour. Occasionally a fine, narrow, garnet strip (#5) is useful if plus contour is excessive. Care must be exercised against excessive stripping, to avoid a minus contour or an open contact. 5. Contouring is accomplished by alternating between the knife and file and the strips, with most of the work being done with the knife, which usually requires resharpening during the procedure. 6. Ease off separator gradually and as soon as possible. The separator is usually removed before the final polishing with the worn out strip. 7. Be sure that all excess is trimmed off, flush to cavosurface margins, especially at the gingival margin. Check it with the gold knife. 8. Finishing of the labial, proximal and lingual is completed by progress­ing from the coarser to the finer and still finer strips, until a final satin finish is accomplished with a worn out extra-fine, extra-narrow cuttle strip. 9. No further polishing is done on the labial portion. Anything beyond the satin finish will increase the reflection of light by the gold and will make the restoration objectionably conspicuous. The lingual portion may be polished with dry lap emery, followed by dry high polish (309W), on a soft rubber cup in the contra-angle, if desired. Again the curved incisal outline is eliminated. 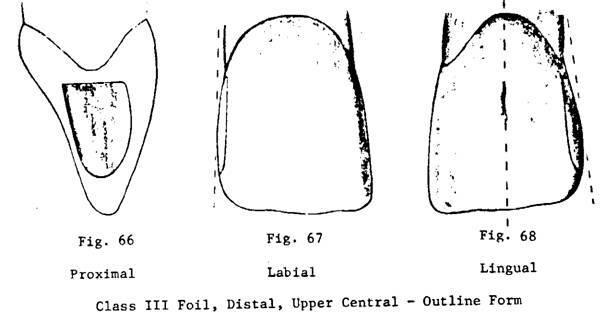 The labial outline parallels the labial contour of the approximating lateral incisor. The modification is partially to improve the esthetic result, but is primarily to enable better compaction of the foil. In some of these preparations proper access for the condenser is very difficult. A direct incisal approach eliminates the problem. The reason for the modification in this location is to improve convenience form and access for the condensing instruments. Here the modification becomes the typical form. Again the curved incisal wall is removed. 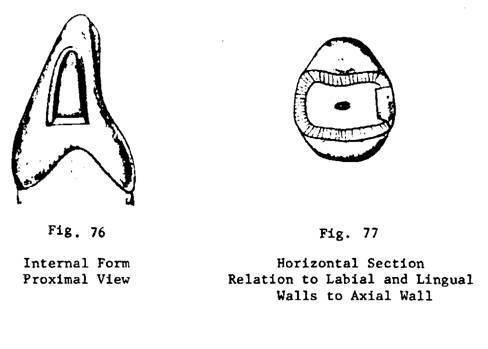 The straight labial outline parallels the central lobe rather than the distal contour of the tooth. The lingual outline is usually straight also, but occasionally it may have a slight curve, to reduce the extent of involvement of the distal slope of the incisal edge. A direct line of compacting force, from over the marginal ridge of the first bicuspid, is provided. In spite of the improved access, care is required to obtain a dense, well-compacted linguo-gingival shoulder. The preparation is box-like in its entirety. Positive, accessible incisal anchorage is established. The gingival wall meets the axial wall at a somewhat more acute angle than in the basic prep­aration. The enamel, at the incisal, is hollowed to provide greater bulk of gold at the incisal edge. c. Avoid involvement and loss of the incisal angle of the tooth. b. These thin teeth may be supported during the preparation and the insertion of the foil. in having a single-planed lingual wall rather than the customary two-planed lingual wall. The incisal retention is definite, but care is taken to not cut it at the expense of the labial incisal dentin as is done in the maxillary preparation. For greater convenience, a linguo-axiogingival convenience pit may be out, using a miniaturized end-cutting inverted cone bur. This preparation may take one of two forms. If the lesion develops coincidentally with one in the mesial surface of the first bicuspid, a typical Class 3 preparation may be cut, while the bicuspid is open and partially prepared. Aided by mechanical separation, adequate access is obtained for a very small preparation. The second form of preparation is used when the mesial of the bicuspid is not open or involved. Here, greater access is required, so a proper line of force may be obtained over the prominent mesiobuccal angle of the bicuspid. Esthetics is not a restricting factor. The labial is opened freely. It parallels the central lobe of the cuspid. The lingual wall is left standing whenever possible, but it clears the bicuspid somewhat more than in the incisors, for the immunity and access to home brushing of this area are less than is the case in the incisor region. The incisal outline clears the bicuspid contact and curves strongly to meet the labial outline. It is not cut away as in the case of the maxillary cuspid. The gingival is straight labio-lingually; it is carried under the free gingiva, and meets the labial and lingual in a definite angle. Internally, as usual, retention is between the gingival and the positive, acute axio-incisal angle. The gingival wall, as in the basic preparation, is single-planed, and meets the axial wall in a definite acute angle. The entire preparation is box-like. 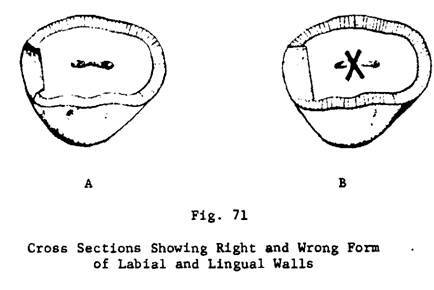 The labial wall is two-planed as usual. The lingual wall is cut in a single plane from axial to cavo­surface, similar to that in the mandibular incisor. A separator is placed as usual for the insertion of the foil. Compaction is entirely from the labial, except in the case of replacing a restoration in a preparation that destroyed part of the lingual wall. 4. Gold foil operations. University of Washington Press, 1959, pp.77-84. a. Carious lesions with minimum facial extension - less than 1 mm. b. Replacement of failing restorations with minimum facial extension. c. Limited mainly to maxillary teeth. 1. Open from lingual with a ½ round carbide bur in high-speed contra-angle. 2. Extend lingual outline with a 700 carbide bur in slow-speed contra-angle. 3. Remove bulk with a 33½ bur in slow-speed contra-angle. 4. Establish facial wall with the end of a 33½ bur in slow-speed contra-angle. 5. Establish incisal wall with the side of 33½ bur in the straight handpiece. 6. Establish gingival wall with the end of a 33½ bur in the straight handpiece. 7. Complete lingual outline with a Wedelstaedt chisel. 8. Establish lingual wall with the side of a 33½ bur in the slow-speed contra-angle. 9. Plane gingival wall and gingival third of facial wall with the chisel end of cutting instrument 100. 10. Plane the remainder of the facial wall and the incisal wall with the hoe end of cutting instrument 100. 11. Plane the lingual wall with the hoe end of a 100 or with an A-25. 12. Make gingivo-axial angle acute with bayonet angle former. 13. Establish an acute linguo-gingivo-axial angle with the offset angle former. 14. Establish an acute facio-gingivo-axial angle with the angle former A38-39. 15. Establish incisal retention with the Jeffery hatchet 3-2-32. 16. Place convenience pits in the facio-gingival and the linguo­-gingival with a 33S bur in the straight handpiece. 17. Refine the lingual outline with a Wedelstaedt chisel and a No. 56 plain fissure bur in the slow-speed contra-angle. 2. Begin by condensing a 1/128 or 1/64 pellet into the facio-gingival convenience pit. 3. Fill the facio-axio-gingival retention. Use a B-2. 4. Build a bar across the gingival to the lingual. Use a B-2. 5. Fill the linguo-axio-gingival angle with 1/128 pellets with the offset condenser. Use a B-4. 6. Cover the entire gingival wall including the cavo-surface margin. Use a B-3. 8. Build up the restoration with the monangle condensers B-3 and B-3S, keeping the facial ahead of the lingual. Use B-3S along the facial cavo-surface margin. 9. Place two 1/128 pellets with hand pressure into the incisal reten­tion. Use the contra-angle condenser, Jeffery No. 21. Then condense with the back-action condensing point No. 5 in the automatic condenser. 10. Complete the insertion of the foil on the lingual with the B-3 condenser and the back-action condenser. Use the back-action condenser, if necessary, for the incisal wall. 11. Condense any surplus gold appearing on the labial with a monangle or a foot condenser of suitable size. B-2, B-3 or B-9. Support the restoration with an instrument on the lingual while condensing from the facial. 12. Add gold on the facial, if necessary. 13. Burnish the facial gold with a carving instrument, D-3 or D-4. 14. Burnish the lingual gold with a burnisher F-2. 2. Enlarge facial and lingual embrasures with a gold knife, B-51. 3. Slide a length of matrix metal, 5 cm, through the contact area. 4. Pass an extra-fine extra-narrow cuttle strip through the contact area several times. 5. Repeat with a fine extra-narrow strip. 6. Repeat with a medium wide strip. 7. Use files, where possible, to reduce the bulk of gold over the margins. 8. Reduce surplus on the lingual contour with an abrasive point F-2 in the straight handpiece and with a cleoid. 9. Reduce surplus proximal contour with a gold knife B-51 and medium narrow cuttle strips. 10. Finish with cuttle strips, fine narrow, and extra-fine extra-narrow. 12. If necessary, disc lingual with medium and fine 3/8 inch cuttle discs in the Sproule mandrel. 13. Polish with dry 303 and 309W in a soft rubber cup in the slow-speed contra-angle. Class III cavity prepared in lower right lateral incisor, mesial surface, for the reception of gold foil as the restorative material. 1. The lower class III preparation differs from the typical upper proximal foil preparation. Proximal surface caries occurs least frequently in the lower incisors. 2. The relative immunity of these surfaces and the fact that these teeth are small and delicate permit very conservative cavity preparations. 3. The incisal angle must be safeguarded above all else for it is most difficult to restore esthetically. a. The lingual wall is left standing to preserve the strength of the incisal angle. b. The incisal outline may be restricted, and not include the complete area of contact. c. The lingual outline clears the approximating tooth only enough to permit proper finishing of that margin of the restoration. d. Routinely, a mechanical separator is placed for the complete operation to permit maximum conservation in the preparation and to support these small teeth throughout the procedure. a. Maximum conservation of tooth structure, especially incisal angle. c. Relative immunity of these surfaces to decay permits compromise with the general rule of extending to an area that is readily cleansable. a. Placed uniformly beneath level of the normal gingival tissue. b. Approximately perpendicular to long axis of tooth. d. Meets lingual and labial at a definite angle. a. Similar to labial outline for upper incisor, but much more restricted. 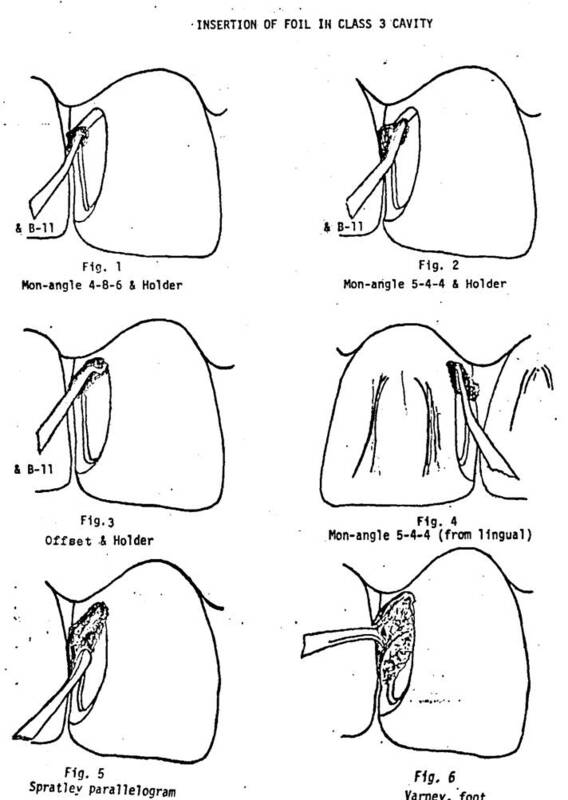 b. Gingival three-fourths parallels corresponding marginal ridge of the tooth generally, yet conforms with the contour of the labial surface of the approximating tooth. c. Incisal one-fourth is a curve which blends gracefully into this line and into the incisal outline. d. Meets gingival at a definite angle. a. Parallels and barely clears the contour of the approximating tooth. b. Meets gingival at a sharp angle. c. blends smoothly into the curved incisal outline. a. Curved to blend into labial and lingual outlines. b. Includes contact area if possible without endangering incisal angle of tooth. If the contact area extends to the incisal edge, the high immunity to decay of these teeth, justifies restriction of the outline, rather than involving the very difficult restoration of the incisal angle. c. May not include full incisal extent of the contact area. (1) Incisal angle of tooth will not be endangered. (2) Proper internal incisal form may be obtained, and yet preserve adequate dentin support for the incisal enamel. 1. Resistance form is required to meet forces applied during insertion and compaction of the foil. 2. 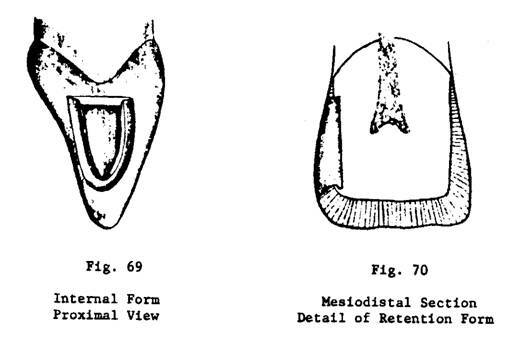 Retention form is established between the gingival and incisal portions of the preparation (Fig. 78). b. Slopes gingivally to meet axial just within dentin at slightly acute angle. c. Meets labial and lingual walls at sharp definite angle. a. Is in two planes, - enamel wall and dentin wall. b. Dentin wall meets axial just within dentin in a definite, slightly obtuse angle. c. Is of uniform labio-lingual thickness from gingival to incisal. a. Is in single plane. b. Meets axial at right angle. a. Is in two planes. b. Line angle of enamel and dentin planes of wall fades out into the single-plane lingual wall. c. Dentinal portion is definitely retentive and meets axial at acute angle. d. Incisal retention should provide bulk of foil without weakening incisal enamel. It is cut incisally only. Attrition wears the labial and incisal surfaces of lower anteriors, so the incisal undercutting cannot be inclined to the labio-incisal as in upper incisors. d. Meets each peripheral wall at definite angle. a. Labio-axiogingival and linguo-axio-gingival point angles are sharp, cleancut, acute. b. Cut more at expense of labial and lingual respectively, rather than gingival or axial. 1. Requirements are for instrumentation access for the preparation and for the foil insertion and compaction. 2. A very small linguo-gingival pit may be used to enable more bulk of foil in the linguo-axio-gingival point angle area. 3. All instrumentation is from the labial. Normally none is done from a lingual approach. a. Minimize cutting of labial tooth structure for access. b. Stabilize these slender-rooted teeth. c. Distribute the operative forces, rather than confine them to the tooth being restored. 1. The enamel walls are planed smooth with a freshly sharpened cutting instrument. Care is taken to insure dentin support for all enamel rods. 2. There is no cavosurface bevel beyond that which is established coincidentally with the planing and truing of the cavosurface margin to remove loose or fragile enamel rods and to create a continuous regular margin. 3. The labio-gingival cavosurface angle is rounded very slightly to relieve any severity in form at this point in the restoration.